It is amazing what a full-length reciprocating saw can do. What is even more amazing is what a compact reciprocating saw can accomplish despite its size. Since a lightweight reciprocating saw addresses slightly different needs than a full-length one does, you will need a different guide when looking for one. Here is a brief review we have prepared to help you find the right reciprocating saw for your smaller cutting needs. It is lightweight, compact, and portable. The speed can be adjusted to match the material being cut. Blade change is easy, quick, and simple. It does not come with a battery and a charger. When we had to clear a small patch of shrubbery beside our house to make way for a garage, we were told that a reciprocating saw was what we needed. There was a lot of unwieldy branches to remove, so off we went and bought a full-length, heavy-duty reciprocating saw. The job was completed nicely and we were happy with the result. The problem showed up afterward when we had to buy a smaller reciprocating saw for cutting in tighter areas. Over time, we ended up using the smaller saw for our rare cutting needs while the first saw was never used again. That was when we realized that although it is true that every woodworker absolutely has to have at least one reciprocating saw in their shop, it is important not to end up with an overkill. Sometimes, all you will ever need is a compact saw like the Porter Cable PCC670B Reciprocating Tigersaw. This lightweight recip is for any aspiring DIY-er, plumber, all-around handyman, or professional contractor who is looking for a small but powerful saw that works in a way full-length saws can’t. Measuring merely 14.5 in in length and weighing only 3.8 lbs, the Porter Cable Reciprocating Tigersaw can get into the tightest of spaces. You can cut with it even at odd angles for long periods and not feel any sign of fatigue. Its variable speed control, pivoting shoe, overmolded handle, and tool-free blade changing system enable the Tigersaw to nearly equal the performance of a full-length saw, but in a smaller package. This is your saw if you want a recip that is lightweight, portable, and easy to use but packs a lot of power. You can choose between corded and cordless reciprocating saws. 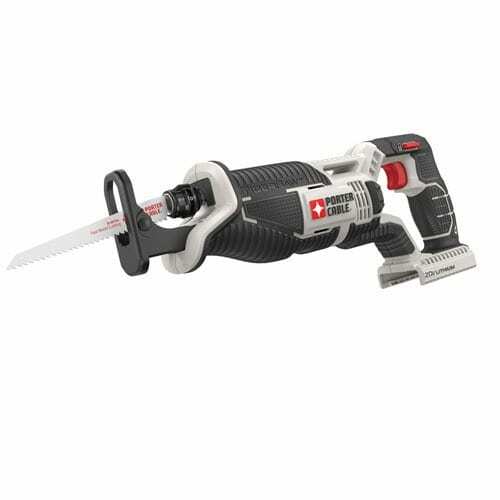 Due to their more stable power source, corded saws are more reliable in making powerful cuts fast. On the other hand, the good thing about cordless reciprocating saws is that they will work anywhere. A high amperage means more power for the saw. If you will be working on small cutting jobs sporadically or on a one-time job, you should be fine with more or less 10 amps. Meanwhile, if you regularly do a lot of cutting every day, it is best for you to go with 15 amps, which is the highest you will likely see in the market now. Measured in strokes per minute (SPM), cutting speed greatly affects the accuracy of the cut. Some reciprocating saws have fixed speeds while many have variable speed settings. Regardless of how often you use a recip, we advise that you go for one with adjustable speed. That way, you can always modify the speed of the blade to match the material you are cutting. Reciprocating saw blades move in two ways: single-plane (or straight) and circular (or orbital). A straight saw moves out of its body in just a back-and-forth motion while an orbital blade moves in an elliptical fashion. Single-plane recips are best used for cutting hard materials while circular saws work best on softer materials. If you browse for reciprocating saws, you will likely find fixed and variable stroke lengths ranging from 0.75 in to 1.25 in. The good thing about long strokes is that they cut faster. Sometimes, though, you want a short stroke that will not go too deep into your material. For its size and weight, Porter Cable’s Reciprocating Tigersaw sure over delivers. It is only 14.5 in long and 3.8 lbs heavy but can cut at an impressive speed of 0-3,000 SPM with modest 1-in strokes. It has some features in place that make it easy and convenient to use, such as the tool-free blade changing system. The fully adjustable speed can be modified to suit any material while the pivoting shoe allows for a stable cut. Its contoured handle is designed to minimize the fatigue on the hands. Finally, since the saw is cordless, you can cut anywhere with it without having to worry about extension cords, generators, and power outlets. The PCC670B Reciprocating Tigersaw is powered by a 20V Lithium-ion battery. This means it will work anywhere provided that you have plenty of batteries in stock. You do not have to find a nearby power outlet or bring an extension to the work site. Also, since there is no cord to limit its range, the Tigersaw can get into hard-to-reach corners and angles. Due to this reciprocating saw’s ultra-light weight, it is highly portable. You can carry it in your belt without it hindering your movements. In addition, your arm and hand will not mind even if you have to cut with it for hours. When cutting into relatively thinner materials, you will want to set your reciprocating saw at a low speed. On the other hand, high speeds do well for thick materials. Porter Cable’s Tigersaw can take care of that, having a speed range of 0-3,000 SPM. While it may sound like an unimportant matter, blade change can really be a pain and make the already arduous task of cutting even more frustrating and exhausting. The PCC670B Reciprocating Tigersaw has a tool-free blade release mechanism that lets you switch blades without having to fumble for other tools. Since reciprocating saws are often associated with heavy-duty work, we went over many reviews to find out what people thought about the Tigersaw. An overwhelming number of buyers loved the saw so much, we knew we had to have it too. People mostly commented about how easy it was to work using the Tigersaw and how it gave great value for money. One of the repeat complaints is about the exclusion of a battery and a charger. The other common observation is that the Tigersaw does not do well in heavy-duty cutting projects. However, we do not see why users would expect it to be an ideal tool for big jobs. With its size and weight, it appeared obvious to us that it was meant for lighter work. All in all, we think the PCC670B Reciprocating Tigersaw should be a shop staple for anyone who does light cutting jobs and wants an equally light tool that works. This compact saw from Makita has the same variable speed as the Tigersaw and a slightly shorter stroke length of ½ in, which cuts thinner materials faster. It also has a tool-free blade change system that reduces downtime. There are some neat features that enhance the user’s experience. It has a built-in LED for better visibility and a soft-grip rubber handle that minimizes fatigue and provides better control. Finally, it conveniently has a dual-position power switch that allows for easier operation mode switching. Similar to the Tigersaw, Black+Decker’s compact reciprocating saw provides a tool-free blade change system for convenience, a variable speed control trigger that can match any material, and a pivoting shoe for an easy operation. It has the same variable cutting speed of 0-3,000 SPM as Porter Cable’s Tigersaw with a slightly more conservative stroke length of ⅞ in. The Bosch GSA18V-038B measures 15.75 in long and weighs 4.4 lbs, making it ideal for use when cutting in narrow, over-the-head spaces for extended periods of time. Its speed of 3,050 SPM is just a bit higher than the Tigersaw’s while its stroke length of 0.83 in is a little shorter. Like the Tigersaw, the GSA18V-038B boasts of a tool-free blade change system that promotes maximum productivity. Finally, it has an LED that makes it the tool to use in dark work areas. Milwaukee’s Hackzall M18 runs on a high-performance motor that delivers 0-3,000 SPM with 0.75-in strokes. This enables the reciprocating saw to make fast cuts through both soft and hard materials--wood, steel, plastic pipes, and more. It is unique in that it has a dual-gear anti-vibration system which offers absolute control, precision, and safety. It also has a tool-free blade change system which comes in the form of the Quik-Lok blade clamp. This cordless reciprocating saw from Hitachi has an intriguing fade-free power feature that is associated with its lithium-ion battery. It has a slightly higher no-load variable speed of 3,300 SPM compared to the Tigersaw. The stroke length, on the other hand, is also 1 in. Finally, the CR18DGLP4 has a soft-grip handle that should not stress the muscles too much even during long periods of cutting while the tool-free blade change system should facilitate no-fuss blade switches. There is no use in using a heavy and clunky (not to mention relatively more expensive) full-length reciprocating saw when a compact one can do the job just fine. Porter Cable’s PCC670B Reciprocating Tigersaw is one of these lightweight tools that get the work done right despite coming in such a small package. Its compact size makes it easy to be brought and used anywhere while its variable speed allows for flexibility and lets the saw match any material. Blade changes are easy, simple, and quick. You can get back to work after a very quick downtime instead of having to fuss with wrenches.